On October 2011, the Université de Montréal and the Centre National de la Recherche Scientifique (CNRS) signed the convention creating the Unité Mixte Internationale (UMI) at the Centre de rechercherces mathématiques (CRM). 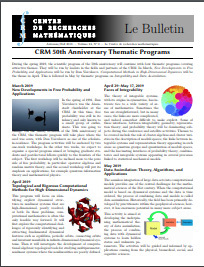 UMI created for 4 years starting on September 1, 2011, is called UMI-CRM and has the mandate of giving an institutional framework to the constructive cooperation France-Québec in mathematics, and to allow us to increase collaborations between French and Québécois mathematicians. To improve its visibility, UMI-CRM now has a website:http://www.crm.umontreal.ca/UMI/.